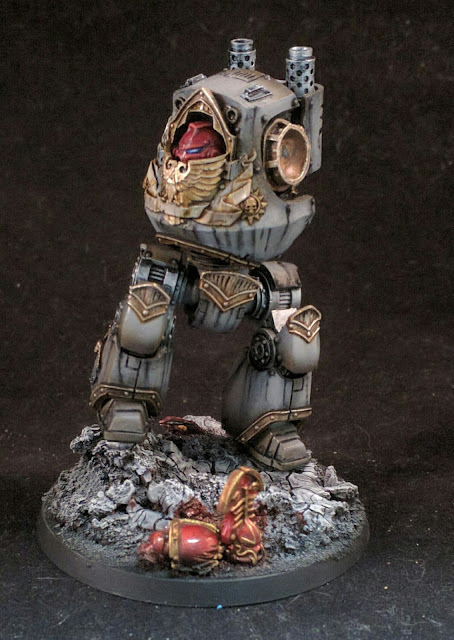 Some Progress shots on the World Eaters Contemptor. Still building the right Assault Claw, I didn't like the Chainsaw appendage, so I made a new Assault Claw. Coming along nicely, I think, just have to finish off the detail work, varnish and then get into weathering. 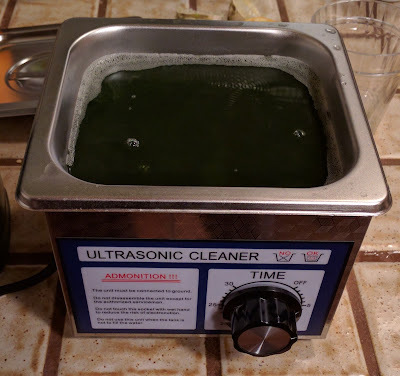 So I finally got around to nabbing an Ultrasonic Cleaner. It only took me around 6 months to actually do this, but this is the bad boy. Add about 1/2 liter (1/2 quart) Simple Green and you're off to the races. I had some metal Statuesque Miniatures Female heads that I was trying to strip. After 6 months in the Simple Green, it still hadn't dissolved. Ten (10) minutes in the Ultrasonic cleaner and Simple Green and "Bam! ", the paint is gone. 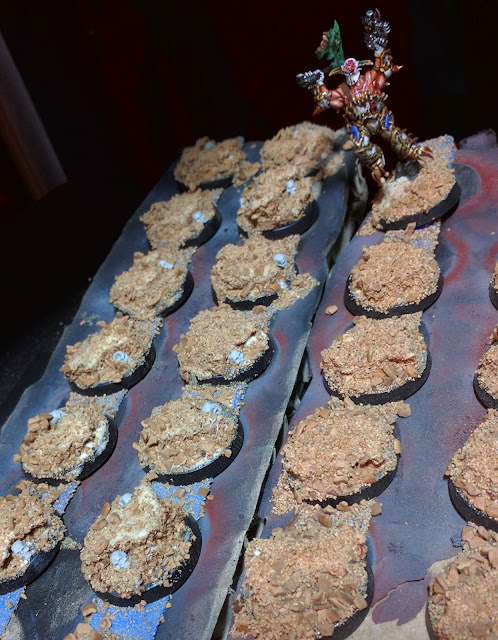 So I have been working on a large batch of World Eaters shoulder pauldrons. Here are some of the progress shots. Back to a few weeks ago I had the blue transitions complete. Here I put down a coat of VGC Brass. Then I followed my usual recipe and washed it back with VGC Sepia Wash.
And to finish up the rest of the batch. Now I have to highlight and put some of the green continents onto the design. With the recent GW Burning of Prospero unveiling, I thought I would finally get around to finishing up my squads of Thousand Sons Tactical Squads. 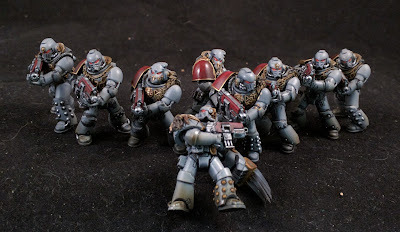 Here is a progress shot of some of the first ten out of twenty Tactical Marines. Still more work to do on these fellows, then I need to hook second lot of ten marines. I finally got around to painting the bases for the Thousand Sons squad. You'll notice the broken pieces look a little familiar. Just need to add some tufts to bring the bases into the same look as all my other bases. Some more progress on the gold on the first Red Butchers squad. So this is where we had left off, last time. Just the usual recipe, VGC Brass washed back with VGC Sepia Wash.
Now I just need to focus in on the silver sections and work out what to do with the power axes. 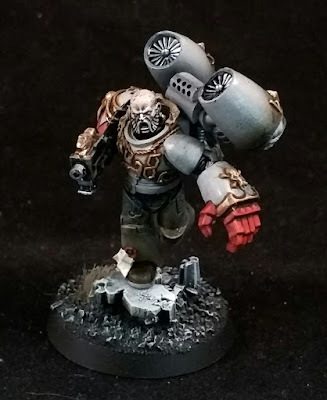 I have been following Lil'Legends Studio's tutorial for the second Red Butchers squad. Here is the progress, so far. Much richer color and a lot more depth in the tones. Here are some progress shots as I follow the steps and screw up steps from the tutorial. VGC Hemp base color with VGA Dark Sea Green in the deep recesses. For the second stage I switched up the recipe and used VGA Cold Grey. 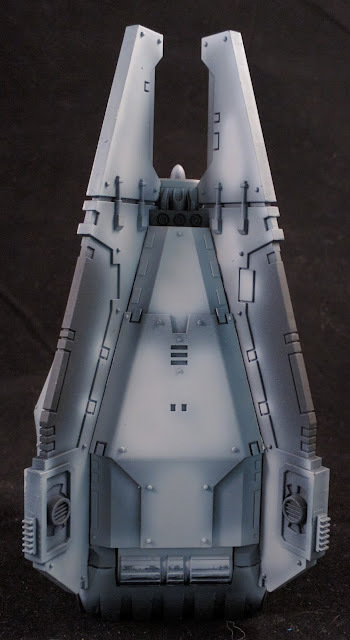 Then I used VGC Stonewall Grey to build up the whiter tones. And the final highlight with VGC Dead White. Further progress on the Leviathan. Building the tones on the white panels. This is a slightly better angle, with different lighting, to show the tonal differences. Now I need to hook into the details. Here are some progress shots. A new torso and re-posing the arms. And adding the new head. You'll recognize it from a few weeks ago. 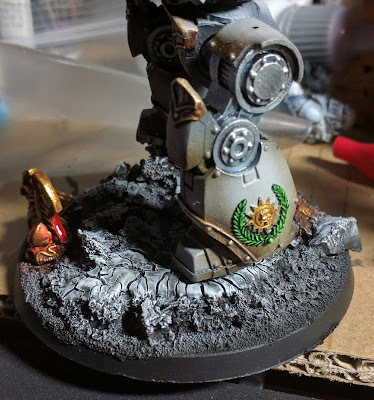 It looked so good on +The FallenStar 's miniature, so I painted another, just for this fellow. I still need to work out what to do about the pauldron. Spiked, plain, just don't know, yet. Khârn the Bloody. Is this too red? 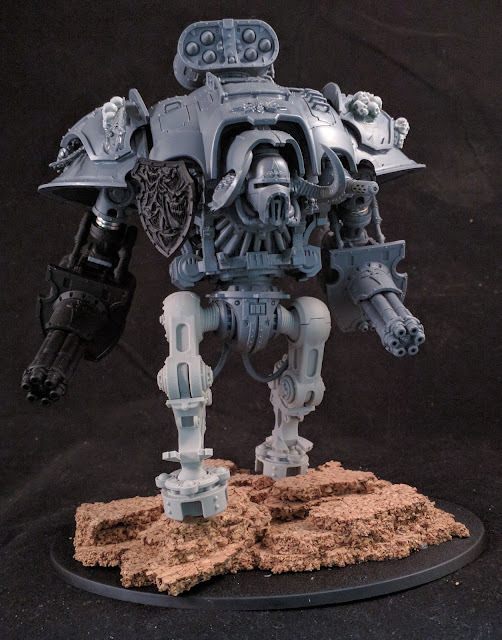 More work on the Veteran Vlka Fenryka. 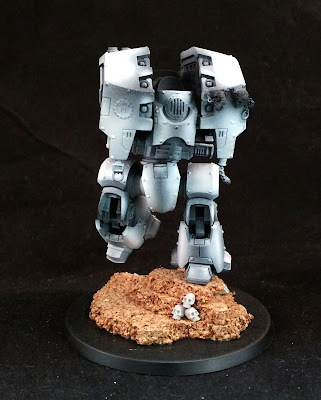 Still with the lighter grey scheme. 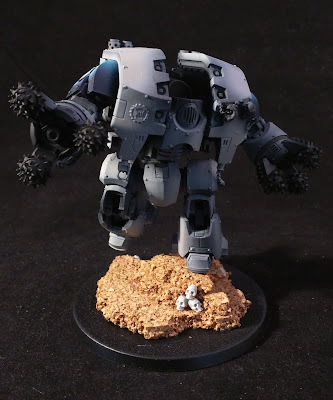 I am thinking I put together another ten (10) Tactical Marines, but with the darker scheme that +The FallenStar conceived. Almost finished on this one. Here is where we are with the squad. You will notice something, the Sergeant is missing. 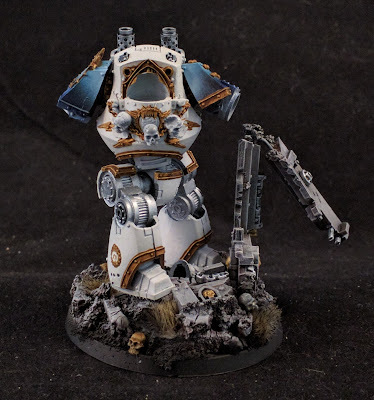 I just wasn't happy with the posing of the sergeant. So I pulled him apart and assembled a new version, with new torso and head. More about that in another post. Some time and a little progress on the World Eaters Leviathan, just base coats and a few initial layers. No highlighting yet. 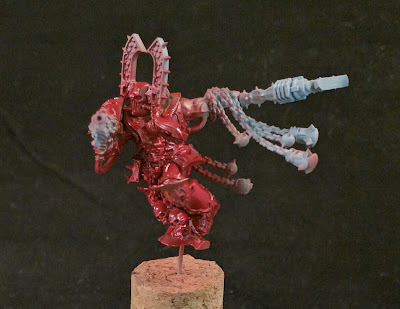 Adding the arms back onto the miniature.